India's annual religious celebrations are a large part of Delhi's multicultural social life, and it's well worth trying to take some time out to enjoy the city's whirl of rowdy activity, traditional dances and vibrant costumes. In addition, several secular festivals are specific to the capital, when performers gather for music, dance and drama events. In this festival, the climax of winter is celebrated with bonfires and singing. 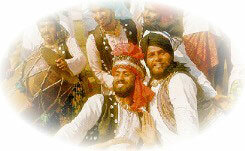 Traditionally, Lohri marks the end of winter. Held on Makar Sankranti day on the green lawns above Palika Bazaar, Connaught Place , this colourful extravaganza attracts national as well as international participants. The biting winter winds continuing till the end of January-early February, when the Hindu festival of Basant Panchami welcomes the spring. This is the season when the prestigious Mughal gardens behind Rashtrapati Bhavan are opened to public for a month. Maha Shivratri is celebrated on the 'Amavasya' night of 'Phalguna'. It is said Lord Shiva danced the 'Tandava Nritya', which means cosmic dance on this dark night. He is worshipped at temples with all night vigils and prayers and unmarried women keep day-long fasts so that Shiva may grant them good husbands. Amir Khusrau's Anniversary is celebrated in April, with a fair in Nizamuddin and prayers and 'qawwali' singing. The event also sees the National Drama Festival, staged mostly at the Rabindra Bhawan. In north India, the Hindu New Year is celebrated on Baisakhi in mid-April just as the sun begins to get fierce and the dusty winds herald summer. It is also known as the beginning of the harvest season. The first full moon night in May marks the birth of the Lord Buddha. Prayer meetings are held at Buddha Vihar, Ring Road and Buddha Vihar, Mandir Marg. Buddha Purnima is the month of 'Vaisakha', commemorates not just Lord Buddha's birth, but also his 'Enlightenment' and gaining 'Nirvana'. In early October, a festival specific to Mehrauli, in Delhi, takes place. This is the Phulwalon-ki-Sair or the Flower Sellers Procession, which originated in the 16th century. The highlight is a procession of people carrying decorated floral fans, which are blessed at the shrine of the 13th century Sufi saint, Khwaja Utb-ud-din Bakhtyar Kaki and at the Hindu temple of Jogmaya, both in Mehrauli. The procession ends with a formal ceremony at the Jahaz Mahal, a 16th century pleasure resort by the side of a lake. Delhi Tourism organises the popular Qutub Festival in October. Musicians and dancers perform at night by the city's 12th century landmark, the Qutub Minar . This festival gives tourists a glimpse of the cultural grandeur of India. On 25th of December the capital witnesses special Christian Eve entertainment's at its all-major hotels and restaurants and the midnight mass and services at all churches. The culmination of the Indian festive spirit is celebrated on the 31st of December, with most hotels and restaurants offering special food and entertainment.